No Perceived Negative Long-Term Health-Related Side Effects: Over the past couple decades, there has been conflicting studies correlating the long-term use of conventional antiperspirants and deodorants with various negative side effects, such as cancer or Alzheimer’s (for more information on this, check out this article here). Natural deodorants, however, do not have any negative claims in regard to long-term usage. There Are Many Different Options to Choose From: Natural deodorants are available in a wide array of formulations and forms – including roll-on, traditional stick form, and aerosol. Common active ingredients include baking soda, activated charcoal, kaolin clay, arrowroot powder, tea tree oil, apple cider vinegar, witch hazel, coconut oil, and magnesium hydroxide. Less Likely to Stain Your Clothes: The aluminum found in conventional antiperspirants combines with your sweat, and almost always results in yellowish clothing stains in the underarm area. Since natural deodorants are aluminum-free, you can expect stain-free (or at least stains that easily come out in the wash) clothing! Many Formulations Simply Do Not Work: What works for some of us may not necessarily work for you. I find that many formulations smell great for a few hours, but do nothing to prevent excessive sweating – resulting in “swampy” underarms and an unpleasant combination of body odor and natural fragrance-masking ingredients. Many Formulations Are Sticky/Gooey, or Have a Peculiar Scent: The traditional stick delivery system can have a sticky/gooey consistency – I find this to be common when there is an imbalance between the oils and waxes (i.e. an excess of oily ingredients in the formulation). The roll-on delivery system often utilizes apple cider vinegar that reminds me of salad dressing. This scent slowly dissipates after an hour of wear, but never fully looses that salad-dressing-like aroma. They Generally Prevent Odor, Not Sweat: Unfortunately with natural deodorants, some sweat is almost always inevitable. I found that after a couple months of using natural deodorants, I perspire far less than I used to. I have even forgotten to apply deodorant for an entire day, and experienced zero odor and minimal perspiration. 1) Vapour Organic Beauty – AER Next-Level Deodorant: Formulated with 70% organic, and 100% natural ingredients, this revolutionary gel-to-powder stick glides on smoothly without taking on the oh so common sticky/gooey consistency. This incredibly effective formula prevents odor and bacteria proliferation via Vapour’s unique plant and mineral complex – with active ingredients including arrowroot powder, baking soda, and a proprietary blend of essential oils. AER Next-Level Deodorant comes in 3 stimulating gender-neutral fragrances: Ginger Grapefruit, Palo Alto Blood Orange, and Lavender Myrrh – all of which are too aromatically pleasing to choose a favorite. I find that this works throughout the entirety of the day without a need for reapplication. *Note: This formula contains silica, however I confirmed with Vapour that the cosmetic-grade non-crystallized amorphous silica they source has been critically tested/OHSA inspected, and is free of trace amounts of crystalline quartz. There is no risk of inhalation to the consumer, as all powders used in Vapour products are suspended in a cream base. Silica and baking soda are proven to be very effective at combatting odor, however have been known to irritate select individuals with sensitive skin. For this reason, I would not recommend this to individuals who are sensitive to either of these ingredients. 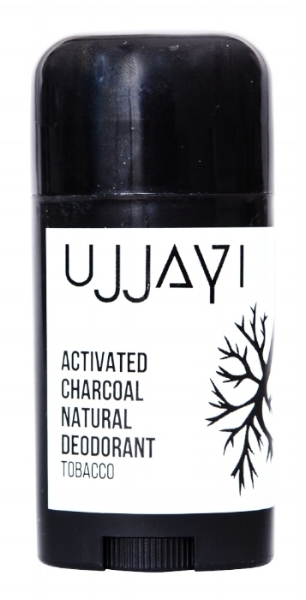 2) UJJAYI – Activated Charcoal Deodorant: This new brand deserves so much more attention for effectively minimizing sweat in addition to eliminating odor – a rare find among natural deodorant brands. This simple formulation is comprised of kaolin clay, arrowroot powder, aluminum-free baking soda, organic coconut oil, shea butter, beeswax, activated coconut charcoal, clove, tea tree oil, and natural fragrance. Out of all the natural deodorants I tried, this was the only one that effectively minimized perspiration. I find that formulations utilizing kaolin clay are superior at effectively combatting sweat (even when the underarm goes unshaved)! This natural deodorant comes in two gender-neutral scent options: Tobacco and Citrus Lime. When I apply UJJAYI Activated Charcoal Deodorant, it works from morning to night – and even longer. For these reasons, this has become my personal favorite of all the natural deodorants I have tried to date. *Note: The label on the current packaging lists “fragrance” – however I confirmed with UJJAYI that the fragrance is indeed natural. New packaging is already planned to prevent any confusion among clean beauty enthusiasts. 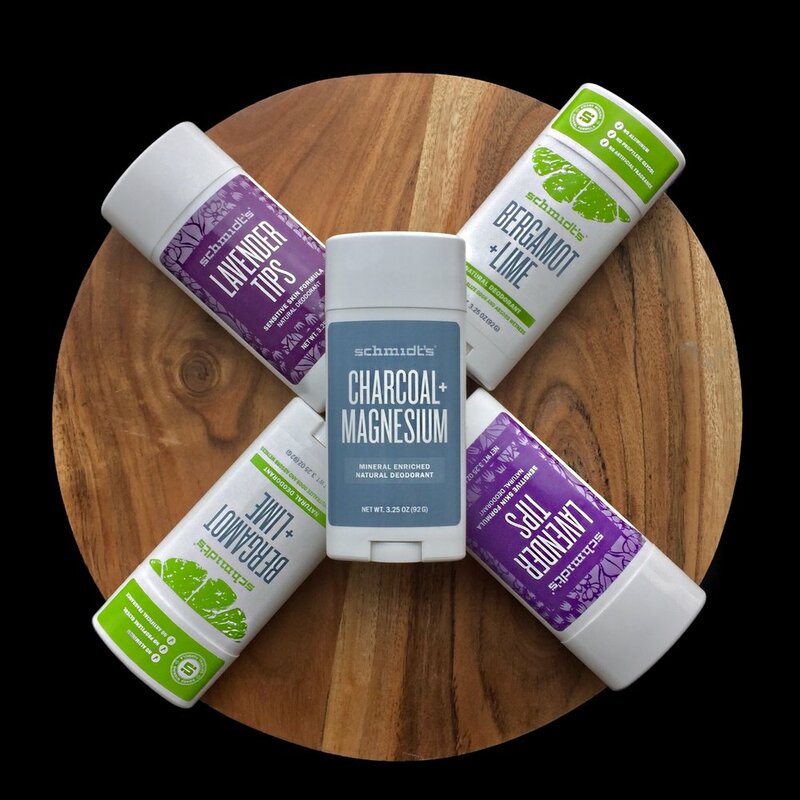 3) Schmidt’s – Charcoal + Magnesium Mineral Enriched Natural Deodorant: This award-winning natural formula completely eliminates odor and lasts all day. The consistency is non-sticky/gooey, and softens on contact with body heat. 1-2 sweeps is all that is needed (a little goes a long way). I highly recommend Schmidt’s to individuals looking for an effective vegan and/or gluten-free option. *Note: This deodorant is not recommended for those with sensitive skin, as certain ingredients in this formulation have been known to cause irritation in select individuals. If you have sensitive skin, I highly recommend Schmidt’s Sensitive Skin Stick Deodorant. 4) Madame Lemy - All Natural Powder Deodorant: The sustainable packaging, natural aromas, and overall efficacy of this brand are everything. Emulating self-care products of the 1920’s, this powder formula comes available in 4 different naturally-derived fragrances - including lemon, lime, lavender, and rose. Besides looking beautiful on the vanity/bathroom shelf, this eco-friendly brand actively supports sustainability by omitting all plastic in their refillable packaging (yes, they offer refills)! This brand is on the pricier side for a natural deodorant, but lasts much longer than a traditional deodorant stick, and leaves your clothes completely stain-free. *Note: This natural formula contains aluminum-free baking soda - which has been proven to be very effective at combatting odor, however it has also been known to irritate select individuals with sensitive skin. For this reason, I would not recommend this to individuals who are sensitive to products containing baking soda. This natural deodorant system works best for individuals who have already switched to using natural deodorant for some time, or have the patience to allow their body to adjust to the formula (i.e. it does not work right away for everyone – and may take up to 10 days before it becomes 100% effective). 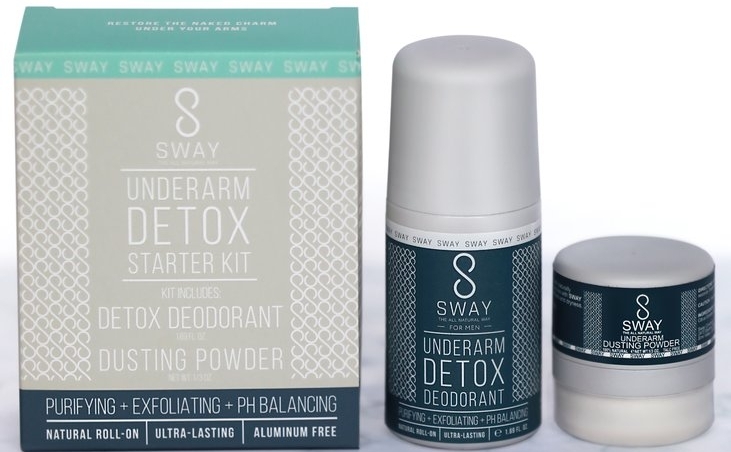 5) Sway – Underarm Detox Starter Kit: For those of you that prefer the roll-on delivery system, this is the deodorant for you. Unlike stick deodorants, this one purifies, exfoliates, and balances the PH of the skin to protect from odor-causing bacteria proliferation. Both steps in this system leave zero residue on clothing – making it a great choice for those who want assurance that their shirts will remain 100% stain-free. Sway comes in one naturally fragranced option for both men and women. *Note: If you do not shave your underarms, you may experience hair snagging on the rollerball – for this reason, I do not recommend this to those who do not routinely shave. This natural deodorant system works best for individuals who have the patience to allow their body to adjust to the formula (i.e. it does not work right away – this system requires application morning and night for the first 10 days before it becomes effective). The vinegar aroma never fully dissipates – and thus this system is not recommended for those who find the apple cider vinegar aroma unpleasant. I found that this system worked incredibly well after applying (both the detox deodorant and dusting powder) twice daily for 10 days – and left zero stains and/or residue on clothing.